Welcome to the analysis of The Silence of the Lambs. Buttons at the bottom of each post enable navigation through the parts of the analysis. You may want to view the table of contents. Regarding the appearance of possible anti-Semitism on this blog, please see the 'Disclaimers' section near the bottom of this page. 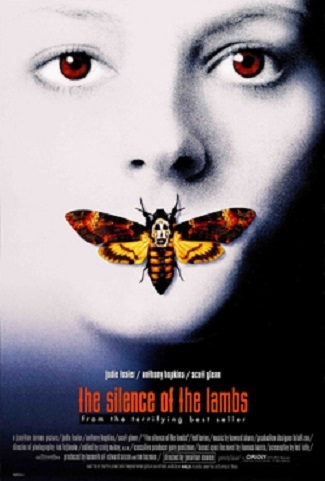 The Silence of the Lambs was released in 1991, and is based on the book of the same name written by Thomas Harris. It was directed by Jonathan Demme (pronounced 'DEM-ee'), and the screenplay was written by Ted Tally. It stars Anthony Hopkins, Jodie Foster, Ted Levine, and Scott Glenn. The film centers around the actions of four main characters: Hannibal Lecter, the insane murderer who partially eats his victims; Jame Gumb, aka Buffalo Bill, the serial killer who skins his female victims; FBI agent-in-training Clarice Starling; and FBI agent Jack Crawford, Starling's supervisor. Underneath the surface action, the movie contains heavy symbolism and metaphor, which this analysis will expose. Top left: Hannibal Lecter. Top right: Serial killer Buffalo Bill (Jame Gumb). Above left: FBI trainee Clarice Starling. Above right: Starling's supervisor, Jack Crawford. Note that Jame Gumb's first name is word play on Jaime/Jamie, both of which can be the name of either a man or a woman; and his last name, Gumb, reminds one of chewing gum, which is placed in the mouth; Gumb places a moth cocoon in Benjamin Raspail's mouth, and in the mouth of one of his female victims as well. Gumb's 'androgynous'-sounding first name functions as a reference to his gender identity confusion - he thinks he will have become a woman if he wears a 'suit' composed of women's skins. Shown at left is Gumb wearing an almost-completed suit of skin. Gumb's skinning of his female victims reminds one of the shearing of sheep (i.e., lambs). Regarding the act of silencing, recall that in a scene early in the movie, Lecter 'silences' fellow prisoner Miggs by making him swallow his own tongue, which results in Miggs' death. Also, Clarice relates to Lecter a story about how, as a child, she had tried to save a special lamb from being slaughtered by workers on the ranch she was living on at the time, by telling it to be quiet while she was running away with it, so that anyone who came looking for her would not hear the lamb and therefore not be able to find her. Jack Crawford represents a father figure for Starling, in that he appears to her to be such. He assigns her to consult Lecter, to get information that will, hopefully, help the FBI apprehend Buffalo Bill. a. Poster for The Silence Of The Lambs: The poster art copyright is believed to belong to the distributor of the film, Orion Pictures, the publisher of the film or the graphic artist.